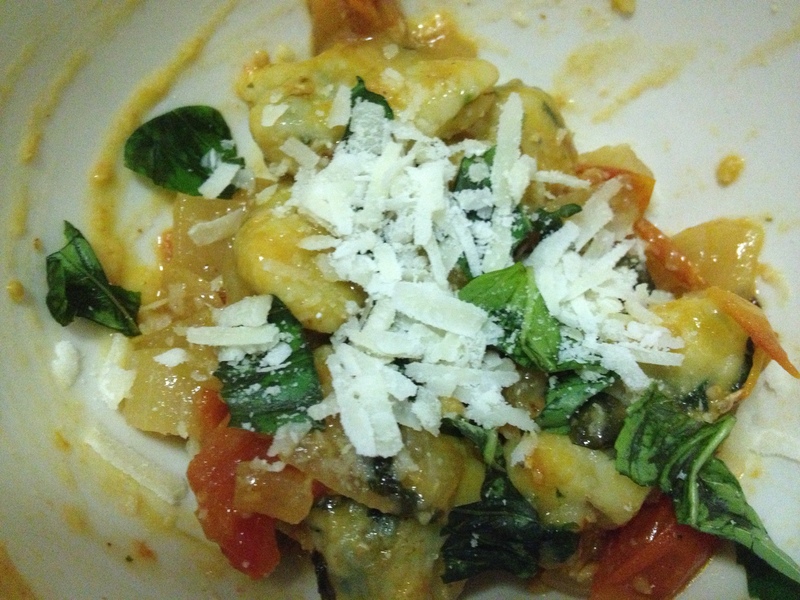 When I saw the recipe for tomato basil sauce, I knew I wanted to make a pasta to go along with it, but I sadly don’t have a pasta maker, so my mind went immediately to gnocchi. 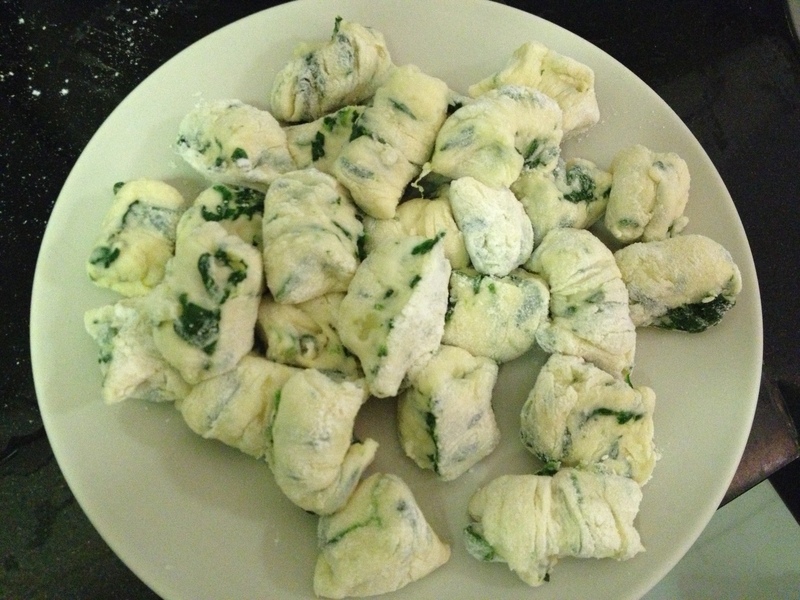 Gnocchi starts from a mashed potato base and is incredibly easy to make. There are all sorts of varieties, but I wanted to make a spinach one to sneak some good veggies into the carbs. I looked at several recipes and ended up combining a couple of them. Some call for eggs, some call for egg whites, some for ricotta, some for parmesan…there are a lot of possibilities. I ended up going with freshly grated parmesan since that is my favourite cheese and I think it added great flavour here. You could use frozen spinach, but I took a big package of fresh spinach and just wilted it in a pan for a couple minutes over medium heat…simple. In retrospect, I would have actually whizzed it in a blender so it would have been more liquid-y and consistent in texture and then added it to the potato mixture so the entire pasta could have had more of a greenish tint. This way, you can’t really taste the spinach, but it’s still a bit more interesting than just plain gnocchi. Of course, you can always use sweet potatoes or butternut squash as a base as well to get a variety of different flavours. Whatever you are using, make sure you don’t add too much flour since you don’t want the dough to become too hard, but you need to be able to handle it well enough to roll it into a thin log. 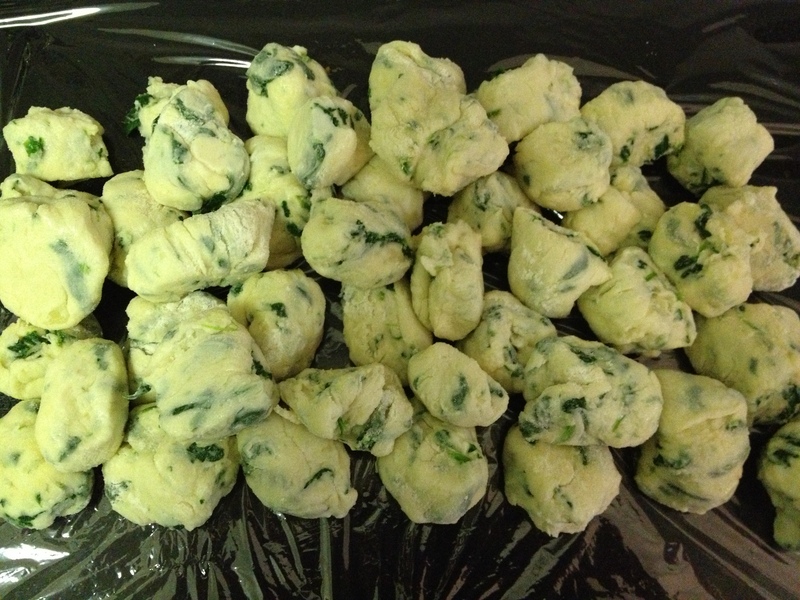 Because I didn’t want my gnocchi to completely fall apart, I put them in the freezer after forming them for about 10 minutes before cooking them. You can also wrap them securely in plastic wrap and put in the freezer for several weeks and once they are thawed and cooked they will be just as good as the day you made them. 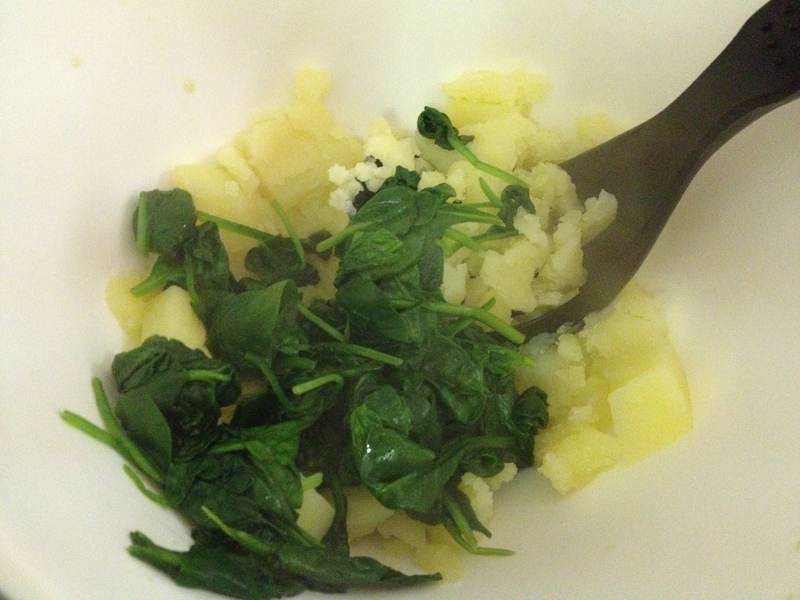 In a pot, add water and boil potatoes until soft. Drain water and mash potatoes. 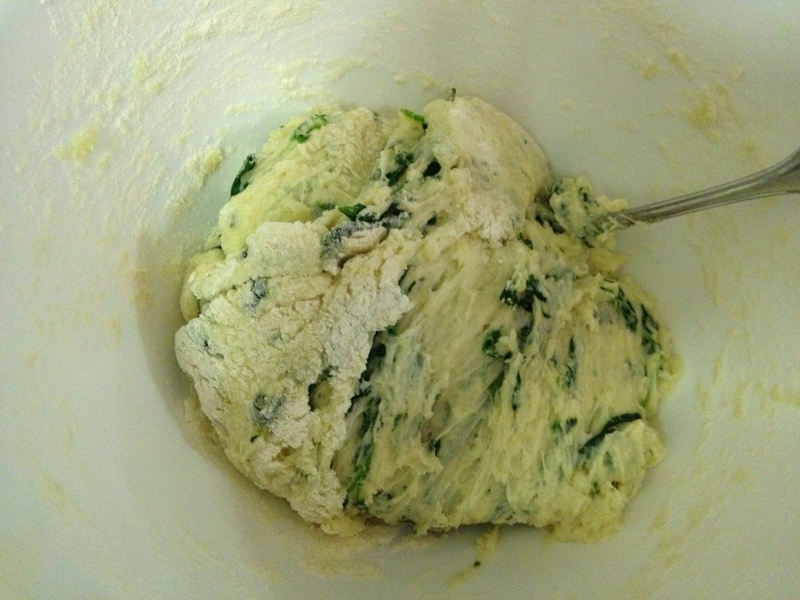 Add eggs, salt and pepper, and then mix through the spinach (try pureeing it in a blender first or just mix in as is but make sure it’s cooked) and the cheese. Then add one cup of flour and gradually add a bit more until you have a dough, but don’t overmix. On a floured surface, roll into logs, adding flour when the dough gets too sticky. Cut into bite-size rectangle shapes and put on a plate in the freezer for 5-10 minutes. When you’re ready to cook, drop the gnocchi into salted boiling water in batches, for about 3 minutes or until the gnocchi has risen to the surface. Remove with a slotted spoon and plate up with your favourite sauce and some fresh Parmesan. Voila, homemade pasta really can be that easy. They can be all lined up and wrapped in saran wrap and frozen until you want to cook them. Just take them out and thaw for about five minutes before putting in boiling water. Top the finished product with your favourite sauce and fresh Parmesan! For those of you (aka, most people who read this) who don’t have a pasta maker but want a homemade pasta touch to a meal, gnocchi is definitely the way to go. These were so light and complimented the tomato sauce perfectly. And this makes a really huge batch (probably enough for 5-6 people) so you can always just freeze half of them for later!